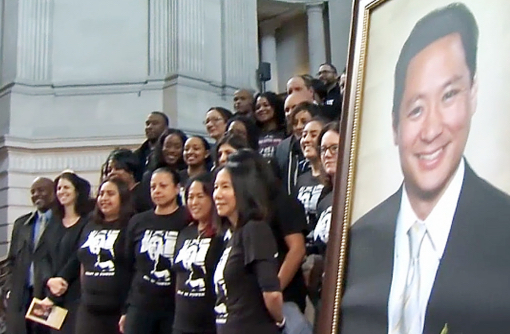 SAN FRANCISCO — The City and County of San Francisco Office of the Chief Medical Examiner on March 22 issued a report stating that Public Defender Jeff Adachi had cocaine in his system the night he died. Exactly a month earlier, on the night of Feb. 22, paramedics found Adachi, 59, unresponsive in a Telegraph Hill apartment. According to ABC7, they shocked him multiple times and were able to get a slow pulse, but lost it a few seconds later. He was taken to California Pacific Medical Center, where he was pronounced dead. A woman identified only as “Catalina” told investigators she and Adachi had some cannabis edibles and a glass or two of champagne with dinner. During the dinner in North Beach, Adachi complained of severe stomach pain. Moffatt found evidence Adachi had suffered a heart attack earlier that day, but did not find it a factor in his death. Without mentioning the report, the Public Defender’s Office issued the following statement on March 24: “When Jeff Adachi began as S.F. public defender five terms ago, our office barely had computers. Lawyers did most if their own investigating and paralegal work. Now we have a strong team of both, along with social workers. “Jeff spearheaded removing fines and fees for our clients, the Clean Slate program, and our MAGIC programs, which work with the communities most hit by crime, bringing children thousands of books and back-to-school supplies. “When he died he was working on booting the predatory for-profit corporations that charge inmates to use the telephone. He exposed corrupt abusive cops and worked diligently to tackle homelessness, addiction, and mental health issues. Under his watch, juvenile crime has plummeted 80 percent. Online comments about the coroner’s report have varied widely. Some supporters have suggested foul play and a cover-up, while critics have accused Adachi of being a drug addict and said that any cases he tried should be reopened. Others have questioned whether such salacious details should have been made public. The sudden and unexpected death of Adachi, who had just started his fifth term as the state’s only elected public defender, has been ruled an accident. He is survived by his wife and daughter. At a public memorial held at City Hall on March 4, speakers included Mayor London Breed, former Mayor Willie Brown, poet Janice Mirikitani, Paul Osaki of the Japanese Cultural and Community Center of Northern California, Rev. Bob Oshita of Buddhist Church of Sacramento, Rev. Ronald Kobata of Buddhist Church of San Francisco, Adachi’s brother Stan, and Matt Gonzalez, chief attorney at the Public Defender’s Office. San Francisco Supervisor Matt Haney has suggested renaming a South of Market street after Adachi. Currently known as Gilbert Street, it is between Brannan and Bryant streets and runs parallel to 6th and 7th streets. Raju added that Adachi’s family was honored by the proposal. In other developments, the San Francisco Police Officers’ Association has cut ties with one of its former presidents, Gary Delagnes, following his inflammatory Facebook post just days after Adachi’s death. Adachi had an adversarial relationship with the SFPD, often accusing police officers of misconduct. Delagnes also made comments about Adachi’s personal life that, according to current POA President Tony Montoya, damaged the union’s efforts to build goodwill with City Hall. The Board of Supervisors has called for hearings on who was responsible for police reports about Adachi, including photos of the interior of the apartment where he was found, being leaked to local media almost immediately after his death.